In late March 2016, the Social History Association (SHA) met for its annual conference. In beautiful Lancaster, at the University of Lancaster, a large group of energetic scholars met to share new research, connect with colleagues, and celebrate four decades of successful operation. This was my first engagement with the Association. I have hesitated to identify strongly with particular methodological strands within the historical discipline as, until recently, my work has revolved around distinctly inter- and extra-disciplinary Indigenous scholarship. As a member of the Harnessing the Power of the Criminal Corpse team, however, I am feeling a sense of a new disciplinary adhesion and belonging. I hoped the SHA would be a good fit, and I was not disappointed. My intention with my paper “Locating the Power of the Criminal Corpse” was to make myself visible for the first time to and within the SHA membership. With this, I hoped to lay foundations for connections and relationships with other social historians. I came to our project team in the last stages of the Project’s work, but I am extremely proud of the quality of work produced by the team and the important interventions members have and are making. This conference was an opportunity for me to share and amplify the work of our team and increase the impact and uptake of our research among our wider networks of colleagues. 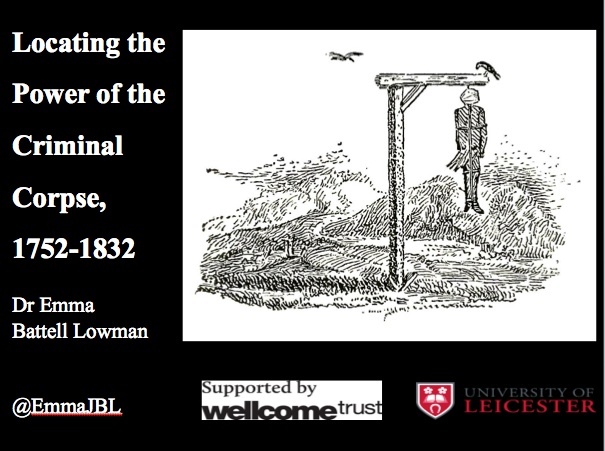 Finally my paper, “Locating the Power of the Criminal Corpse,” introduced three stories, at least one of which was familiar to the attendees who were well-versed in 18th and 19th century British history. I used these three cases – Earl Ferrers whose elite status influenced the degree of his postmortem punishment, Joseph Armstrong who attempted to escape the horror and terror of public execution and postmortem punishment by taking his own life, and William Jobling whose disproportionate punishment has made him something of a working class hero – to draw out questions about how power inheres or is ascribed to different criminal corpses during the period of the Murder Act (1752-1832). The temporal and thematic flow that developed between our papers over the course of the session was a direct result of thoughtful and creative conference planning, and resulted in a session that was immediately more useful to the presenters and fostered an integrated and dynamic discussion. One of the most engaging aspects of the Social History Association conference, and one so useful I will carry it forward and put it into regular practice, was the use of Twitter. This wasn’t the first conference I’ve attended that sought to facilitate – and actually encouraged – social media engagement. Frankly, it has often been difficult to see the point of spending time on my phone during sessions or plenaries when so much important information is being presented, or to escape the feeling that doing so would be – and would personally feel – extremely rude. It helps to meet one of your Twitter favourites in person and in the process of tweeting during a session (huge shout out to the AMAZING @HelenRogers, the doyenne of #twitterhistorians /#twitterstorians who was very gracious indeed when I fangirled her…). 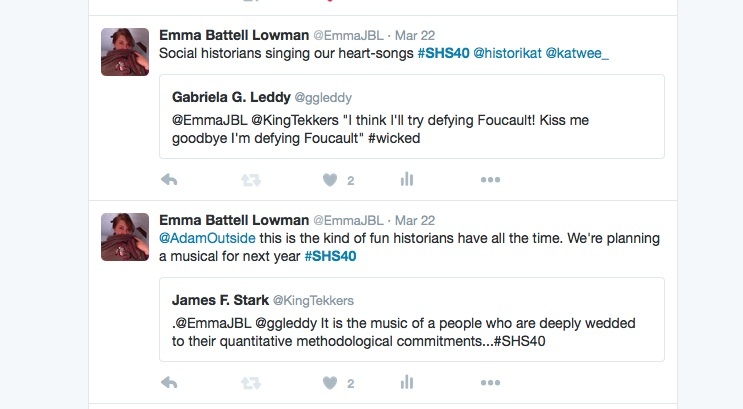 Some early positive reinforcement kept me connecting through the conference hashtag #SHS40. Twitterhistorians live tweeting parallel sessions let me listen in on sessions I couldn’t physically attend. My own tweeting let me amplify key points raised by others that resonated with or challenged me, and share those points and perspectives with people at and beyond the meeting – with historians, geographers, and those outside the academy all retweeting or chiming in. Humorous? To us, certainly. Flip? Possibly. But never disrespectful and in fact adding a new perspective to our conference conversations as we, as a group, were keenly engaged in the meeting, delighting in our work, and widely sharing intellectual terrain. Connections developed during the meeting in the twitterverse led to in-person introductions and conversations. We used #SHS40 and created a focused but open forum for furthering the intellectual and social goals of the conference, and it significantly enhanced my experience at the conference and improved relationship-building with new contacts. Social media conversations cannot replace sustained scholarly discussions (as one attendee in Helen’s session pointedly noted). But as we all must know, they are certainly not intended to. Instead, Twitter – or whatever other social media the kids are using these days! – is a tool we can use to augment scholarly engagement and conference experience. The record of these conversations is preserved online and fully open access, and perhaps that also is a benefit of this form of engagement.